24 Hour Towing Pittsburgh - Ran Out of Gas? If you run out of gas in Pittsburgh we can deliver gasoline to you. A way to notice if your vehicle is about to run out of gasoline is that it will start to make a sputtering noise. When this happens, be sure to pull over to the side of the road and shut off the vehicle right away. It's easy sometimes to forget to look at the gas gauge before it's too late. 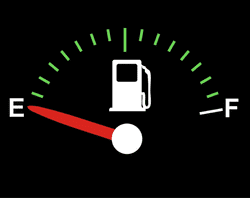 While it is important to look at the gas gauge once in awhile so you don't run out of gas, another reason is so you can protect your vehicle against internal damage. Fuel pumps rely on the gas for cooling and lubricant. If the gas gauge is not functioning right, it's important to get it fixed. We will send one of our friendly service people to deliver gas to you at your vehicle and get you back on the road asap!